Diplopterys cabrerana. 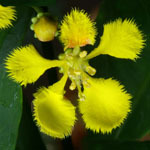 a. Flowering branch. b. Leaf base with marginal glands, adaxial view. c. Node to show interpetiolar stipular ridge. d. Umbel of four flower buds. e. Petals, posterior-lateral (above) and posterior (below), abaxial view. f. Part of androecium laid out, abaxial view, stamen to right opposite posterior petal. g. Gynoecium, anterior style in center. h. Mericarp with short wings, abaxial view (left), adaxial view (center), cross-section (right). i. Mericarp with longer wings, abaxial view (left), adaxial view (right), cross-section (below). Scale bar equivalents: a, 4 cm; b, 1.3 cm; c, 4 mm; d, 1 cm; e, 5 mm; f, g, 2 mm; h, i, 2 cm. Based on: a, b, d–g, Schultes & Cabrera 17297, US; c, Burnham 1900, MICH; h, Krukoff 8971, MICH; i, Williams 14965, US. Drawn by Karin Douthit. Modified from a drawing first published by W. R. Anderson in Mem. New York Bot. Gard. 32: 166. 1981.